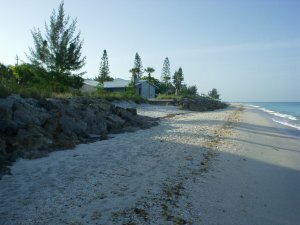 Summary: This project expands a previous armoring gap mapping project and expands the current Beach Inventory data to include the occurrence and importance of gaps between armoring structures on sea turtle nesting beaches in Sarasota and Manatee Counties, Florida. Results: In Sarasota County there are 25 gaps (example pictured at right) that of are 250 feet or less and could qualify for armoring under Florida's Gap-Closure Law. These 25 gaps represent nearly ¾ mile of beach and sea turtle nesting. If five of these gaps are closed, the longest stretch of coastal armoring in the county would be nearly 1 ¼ miles in length. In Manatee County there are 34 gaps of a width of 250 feet or less and could qualify for armoring under Gap-Closure Law. These 24 gaps represent over a mile of beach and sea turtle nesting habitat. If 11 of these gaps are closed, the longest stretch of coastal armoring in the county would be over a 1/2 mile in length.